Below is a listing of locations and information on properly disposing of your computer equipment and batteries, as well as donation information for working computers and electronics. Users who have older working computers may also want to read our suggestions on what to do with an old computer. Note: Most of the companies and locations listed on this page are for residents in the United States or Canada. For companies and locations in other countries, we recommend searching online for recycling locations near you. Computer and related equipment dismantle. Recycling used printer ink cartridges. Because of how many devices use batteries today, it is important that you dispose of batteries not only properly but safely to help the environment and other beings. Also, there are now over 500 recycling laws in the United States and not disposing of the batteries appropriately may result in fines to you or your company. Caution: In no instance can a battery be incinerated. Disposing of a battery by burning causes them to explode. In case of rupture, leaking electrolyte or any other cause of skin or eye exposure to the electrolyte, immediately flush with water. If eye exposure, flush with water for 15 minutes and consult a physician. Additional information on batteries is on our battery help page. Below is a listing of some of these companies. Also, some major electronic retail stores in the United States accept used ink cartridges. Below are a few of the several hundred available companies that can help provide you with information or help you recycle your batteries. Batteries recycled: Able to manage every spent battery manufactured today. Batteries recycled: Lead Acid battery recycling in India. If you have a computer or computer equipment, including computer networking equipment, beyond repair or too old to be useful, we recommend one of the below services for proper dismantle. If you have a usable computer, even if it's old, you may want to consider donating the computer instead of dismantling or recycling it. Many computer and hardware manufacturers also have recycling or trade-in programs. Below is a list of some of the major manufacturers and links to their recycling programs. Below is a short list of some of the major recycling companies capable of recycling computers and computer equipment. Phone and Address: Sims Recycling Solutions has over 50 sites globally. Check the Sims Recycling Solutions website for details. About: Accepts computers, monitors, telephones, and related equipment, and other electronics. Batteries recycled: Accepts laptops, monitors, printers, servers, and other products. About: IBM can recycle any PC with an IBM logo for free. Parts capable of recycling: Only IBM PCs, monitors, printers, and optional attachments. About: Back Thru The Future Technology Disposal is one of the largest computer recyclers in the United States and are a women's owned business. The company recycles microcomputers for corporations, educational institutions, government, and individuals. Back Thru The Future has committed itself to finding uses for this older technology and preventing it from becoming a high tech waste. Parts capable of recycling: All computer equipment. For corporations, educational institutions, government, and individuals. About: Electronic waste recovery specialist of all sorts. Compliant with government regulations that include downstream vendor and supplier audits, operational permits and environmentally compliant processes. Parts capable of recycling: All electrical components and monitors. Phone: Total reclaim has locations in Alaska and Portland, OR. See website for phone numbers. About: Total Reclaim provides environmentally responsible asset reclamation and disposition services to the electronics industry. Total Reclaim is the Pacific Northwest's largest electronics recycler, handling 9,000,000 lbs of monitors, televisions, and other electronics in 2004. About: Morgen Industries offers hard subsidiary, MI Secure, at its facility. About: Provides recycling for most types of electronic devices. About: Provides recycling for nearly all modern electronic devices. About: Company capable of recycling computers, monitors, etc. Many printer manufacturers have recycling programs. Below is a list of some of the major printer companies and links to their recycling programs. Finally, some major electronic retail stores in the United States also accept used ink cartridges. Below is a listing of some of these companies. 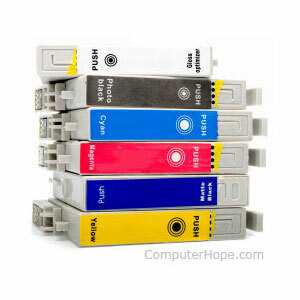 Additional information and help with recycling ink cartridges is also found through the link below. 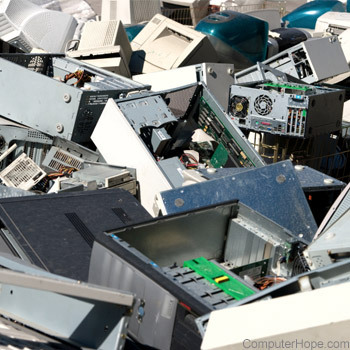 Rather than disposing of your computer, the best option for proper management of "retired" computer equipment is material recovery for all usable parts. If the equipment still functions, consider donating it to a local school or non-profit organization. For computers that are "beyond repair," see the computer and related equipment dismantle page. Below is a list of various organizations that also accept used computer equipment. Call them before sending anything to ensure the item(s) meet their needs. Note: As much as we would like to, Computer Hope does not donate its equipment. About: Accepts computer equipment for donation to organizations serving the disadvantages. About: Nonprofit materials exchange network that connects users and organizations looking to share or gather computer equipment for reuse across America. About: Nonprofit charity providing computer hardware, networking, and technology support. About: Comprehensive electronics recovery, reuse, and environmental responsible partnership between Goodwill and Dell. Has dozens of locations throughout the United States in states such as California, Michigan, New Jersey, North Carolina, Pennsylvania, and Texas. The address and other contact information for each of these locations is found on the above link under participating goodwills. About: Nationwide electronics recycling company. Most of the time the disposal fee is free. They comply with the California Environmental Protection Agency. When your electronics are disposed of, they will send you a free report of what was recycled and a proof of recycle certificate. About: Based in New Jersey, Newtech specializes in environmentally friendly methods of electronic disposal. They also distribute working equipment to a charitable organization. They will accept any electronic equipment except microwaves and air conditioners. About: A Canadian non-profit company specializing in reducing electronic waste in landfills. They collect unwanted computers for reuse, refurbish, and recycling. They donate to charities and other non-profit organizations. They have several drop off locations in the following locations in Canada: Alberta, Vancouver, Toronto, and most of the rest of Canada. About: Based in New Jersey, eRevival is one of the leading electronics recycling companies. They accept any computer equipment and electronic equipment.